It was the kind of ending you would expect to only see from Hollywood. Trailing the New Orleans Saints 24-23 in their NFC Divisional Round playoff game, the Minnesota Vikings had 10 seconds left on the clock and were at their own 39 yard line. Case Keenum dropped back to pass and lofted a pass to Stefon Diggs, who caught the ball at the Saints 34, kept his balance, and ran into the end zone for the game winning touchdown as time expired. Vikings fans at the stadium or watching on television had just witnessed a modern day football miracle, and their bodies were responding appropriately. Several who happened to be wearing an Apple Watch received an alert telling them that their heart rate was dangerously high, running above 120 beats per minute while being inactive over a ten-minute period. A few snapped pictures of the warning and posted it on Twitter. The same thing might have happened to Pittsburgh Steeler fans had the Apple Watch been around in December 1972. That is when Steeler running back Franco Harris made "The Immaculate Reception." This miracle catch off of a deflection resulted in the game winning touchdown over Oakland as time ran out, sending Pittsburgh to the Super Bowl. 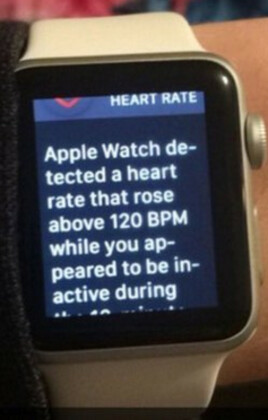 There is no indication that any of the Vikings' fans who received an alert on their Apple Watch ended up at the hospital, or suffered a heart attack. To see what the fuss was all about, click on the video at the top of this story. Does it have to be when clicks= money? Apple should have send this message out when their customers found out about the iPhone slow down. That would be a better news. Don't blame them for being excited. Hell, I lost it when I saw Diggs sprinting down the sideline, and I'm not even a Vikings fan. Dude missed that tackle on purpose. And why is this news again? I can't believe my Steelers overlooked the Jags, and got their asses spanked. The Jags already drilled them once. I don't think they overlooked them. Jags were just better. Being better isn't the issue. The Steelers were looking last them to the Pats, and they made that all too clear. Now they're on vacation. Crazy week for playoffs. Falcons checkout early. Probably good they did after that Super Bowl choke fest they did last year. That Viking/Saints Game was nerve wrecking for either fans. Kinda pulling for Saints but not really vested in either team. I got Eagles/Pats in the big dance. Who you got? Filed under: "Please, stop talking about our failures." This is not even remotely news worthy.